I have been on a macaron baking binge lately. This is latest batch. 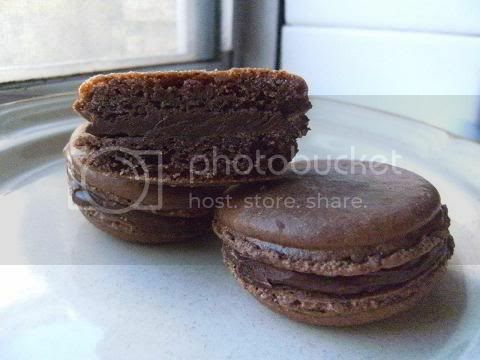 I made the shells as per this recipe (using the simple French method) but I added 1 tablespoon of dark cocoa powder and 1 teabag of pure mint tea and filled the macarons with nutella. The mint had exactly the right punch for the dark chocolate shell and filling. 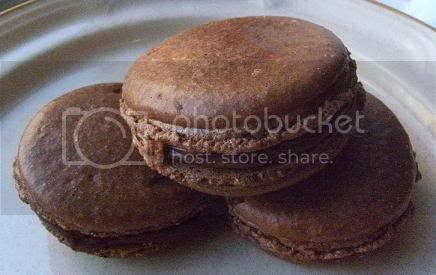 (I froze the sliced macaron shown above so I could get a clean cut it is impossible to cut a room temperature macaron so well. )When you are grinding the almond meal add the contents of the dry mint tea bag so it is incorporated completely. Add the sifted cocoa powder with the icing sugar in the above linked recipe. That's a great flavour combination I'd love to try! Can I ask, how do you incorporate the mint teabag? Do you steep it in hot water first? Mmmmmmmm. It sounds yummy... You are turning into a macaron master. The macarons are looking fantastic! Yum!!! I came over to comment on your daring cooks challenge, but these look magnificent!!! I'm in awe of anyone who's made them and succeeded. These look fantastic. I'm a huge Nutella fan so any recipe which lists it as ingredient must be good. Hello Audax, the macarons can be made using peanut instead nuts? and can I combine peanut and cocoa, for example?